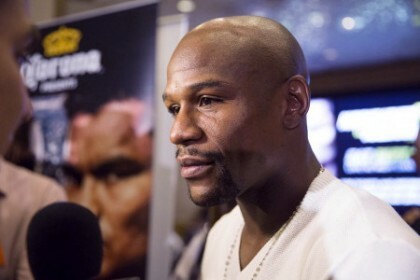 The Floyd Mayweather who crushed Diego Corrales: Pretty enough to have beaten any 130 pounder ever? It was 17 years ago today when Mayweather, fighting at 130 pounds, faced a likewise unbeaten Corrales in an anticipated tough fight for both; a genuine Super Fight. Back then though, Floyd was no safety first, pot-shotting, think about the future operator. No, back then Mayweather was a ruthless warrior of the highest order; a warrior who wanted a KO win and was willing to take risks in order to go home with one. The 130 pound version of Mayweather – this arguably being his best weight – sent fans home happy, content at having witnessed some real, artistic violence. Five times Mayweather sent Corrales to the floor, five times Corrales got up – only to take even more punishment until his corner waved the white towel in a necessary act of surrender the almost insanely brave “Chico” was unable to either understand or appreciate at the time. This was Floyd at his best, no doubt, and this was the “Pretty Boy” at his meanest. This was supposed to be his “Thomas Hearns fight” (in reference to the fighter he is so often compared to: Sugar Ray Leonard, and his date with destiny – his winning battle with Hearns from 1981). Instead, Mayweather gave us a massacre. Maybe, just maybe, one good enough to have seen to it that had this model of Mayweather met ANY 130 pounder in history, he would have had too much for ANY of them. Yes, any of them. There have been some superb super-featherweights/junior-lightweights throughout boxing history – men like Azumah Nelson, Alexis Arguello, Julio Cesar Chavez, Manny Pacquiao, Erik Morales and Marco Antonio Barrera all ruling the world; while the immortal Henry Armstrong, although never a champ at 130 (ruling instead at 126, 135 and 147), showed how he would have been more than capable of facing any man at the weight – but might Floyd, on this special night, have bested ’em all? Previous boxing news: BJ Saunders vs Martin Murray: A good fight or a predictable fight? You are here: Home / Boxing History / The Floyd Mayweather who crushed Diego Corrales: Pretty enough to have beaten any 130 pounder ever?